A Toast to the Holidays: Creative Ways to Serve Your 3-Canister Popcorn Sets! Give a toast to the holiday spirit: Fill a few glasses with our delicious popcorn and spread the cheer to all of your guests! The new 3-canister popcorn sets are here just in time for the celebration, and their many colors and flavors will be a hit with friends and family! But making an even bigger statement with your snacks at the dessert table is easy and virtually effortless: Just pick an assortment (or more!) and pour the popcorn into your favorite stemware to create a stylish and elegant display. The cranberry, peppermint candy cane, and holiday kettle corn in this set makes for a fun, festive and downright delectable treat for the season. Add some extra pizzazz to your holiday spread by serving the popcorn in cute martini glasses and topping it off with candy stripe straws. For those with more serious tastes, the mouthwatering combination of cheese, buffalo ranch, and cracked pepper and sea salt popcorn will be at the top of their list of favorite things. Give this assortment a touch of sophistication by presenting it in beautiful wine glasses or champagne flutes. Nothing is more comforting than sitting by the fireside and enjoying drizzled caramel, s’mores, and dark chocolate sea salt popcorn with the family. For a cozy, laid back affair, hand out this treat in rustic mason jars and tie a festive ribbon around the mouth of the glass. This small sweet-and-savory treat is big on personality: The smooth, sugary taste of the almond pecan, peanut brittle, and butter toffee pretzel popcorn is complemented by a salty crunch. Show off the popcorn’s character and serve it up in mixed-and-matched glassware, like shot glasses and margarita glasses. Which assortment of flavors is your favorite, and how do you plan on dishing it out to your guests this holiday season? Hi Popcorn Factory Fans! 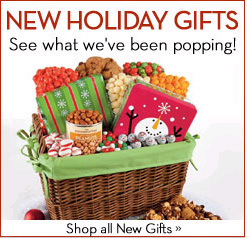 We want to share with you some of our Holiday Popcorn Gifts so you can see what we’ve been popping! In about a paragraph or two, let us know which popcorn gifts from our 2010 Holiday Collection would make for great popcorn memories during your Holiday celebrations! We will choose 3 winners at random. We are passionate about popcorn and we absolutely love to hear your feedback and thoughts. You probably guessed the passionate part from our name, The Popcorn Factory!